The largest mangrove forest in the world is a mist-shrouded, river-riddled swamp region of shifting tides, man-eating tigers and off-the-beaten-track adventure. It's surrounded on three sides by two of the most densely populated countries on earth – India and Bangladesh – yet it remains remote, inhospitable and largely uninhabited by people. This is truly wild terrain, and chug-chugging along its river channels into its swampy heart of darkness is as thrilling as it is serene. The star attraction is the Royal Bengal tiger. Around 400 of these magnificent creatures call the Sundarbans home, making this the largest single population of tigers on earth. Despite their reputation as man-eaters, they are extremely difficult to spot, but the thrill of trying to track one down is hard to overstate. And even if you see none, simply sitting on the deck of your boat as you float through thick mangrove forests is an unforgettably dreamy experience. 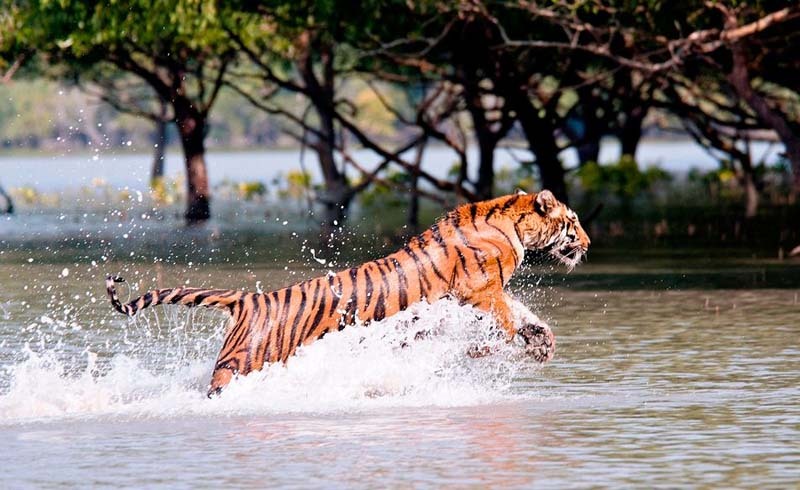 The Sundarbans is shared roughly 60-40 between Bangladesh and India and you can visit it from either country. The India side is more easily accessible, but Bangladesh offers the chance to explore the forests in more depth. Dipping into the mangrove forests on a day trip is a great taste of the mangroves, but to truly experience the thrill of an adventure – and the serenity of the Sundarbans – you need to delve deep into the swamps on a three- or four-day boat trip. This is best done from the Bangladesh town of Khulna. You'll eat and sleep onboard your main tour boat, but you'll also get the chance to break out into smaller groups and track tigers, either on foot (accompanied by armed forest guards) or on smaller boats (along narrower river channels). Most trips travel south as far as Kotka, a deserted mangrove beach on the Bay of Bengal, before working their way slowly back to Khulna. Your chances of spotting a tiger are, of course, very slim, but you are likely to see wild boar, spotted deer, monkeys, reptiles and a huge variety of birdlife. How to: You have to do this trip on an all-inclusive tour, which will start and finish in Khulna (although transport to and from Dhaka can be arranged). The two standout tour operators are The Guide Tours (www.guidetoursbd.com) and Bengal Tours (www.bengaltours.com), both of which have offices in Dhaka and Khulna. Bangladesh Ecotours (www.bangladeshecotours.com) also runs reliable trips. Prices per person for a four-day trip range from around Tk12,000 to Tk20,000 (US$150 to US$250). If you don't have the time or money for a multiday tour from Khulna, you can self-organise a cheap and cheerful day trip from the small river port of Mongla. There's nothing to pre-book – just turn up in Mongla, ask around, and you'll be on a boat the following day. Overnight trips are not permitted from here. Instead, you'll float downstream as far as the Karamjal Forest Station or, if you leave early enough, to the Harbaria Wildlife Sanctuary. With raised walkways, viewing platforms and a small ‘zoo’ the Karamjal Forest Station is hardly the back of beyond, but if you think of it as a fun boat trip rather than an off-the-beaten-track safari you won't leave disappointed. How to: To get to Mongla from Dhaka, either go by overnight train or bus to Khulna, from where there are frequent buses (90 minutes), or take the more adventurous route by paddlewheel ferry (known affectionately as The Rocket) to Hularhat (16 hours), then take a bus (two to three hours) via Bagerhat and Khatakhali. Private boat-tour operators will find you as soon as you arrive in Mongla. For trustworthy advice, seek out the manager at the government-run Parjatan Hotel (also called Hotel Pashur), which is beside the Mongla bus stand. Typical prices are Tk1000 (US$12) for a half-day return trip to Karamjal, and Tk4500 (US$55) for a full-day return trip to Harbaria. This offbeat Sundarbans adventure allows you to trek on foot through the forest, following local workers, known as maualis, as they go in search of the honey produced by the formidable honeybees of this region. The honey-harvesting season lasts for two months, but tour operators tend to only organise a couple of trips in total, and normally only at the start of April. How to: All-inclusive trips leave from Khulna, and can be booked through The Guide Tours (www.guidetoursbd.com) or Bengal Tours (www.bengaltours.com). Expect to pay around Tk10,000 to Tk12,000 (US$125 to US$150) per person. 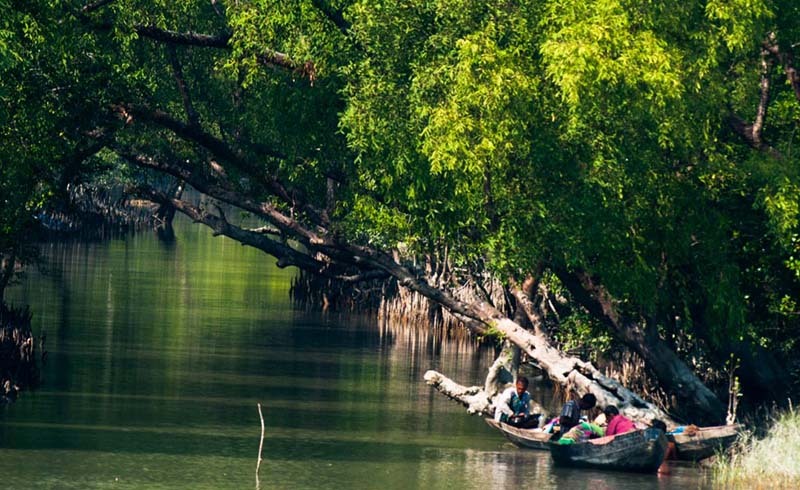 It's also possible to explore the Indian side of the Sundarbans from Kolkata, on similar trips to the multi-day trips that leave from Khulna in Bangladesh. Day trips are possible, but long and tiring, so we recommend you take an overnight tour, sleeping either onboard your tour boat or in safari-lodge accommodation on dry land. How to: A number of tour companies operate out of Kolkata (about three hours drive from the fringes of the Sundarbans), and most trips include transport to and from the city. Backpackers (www.tourdesundarbans.com) and Sunderban Tiger Camp (www.sunderbantigercamp.com) are both recommended, and tours with them can be booked online. Expect to pay around Rs4000 to Rs5000 (US$75 to US$95) per person for a two-day, one-night trip. The cooler winter months (October to February) are the most comfortable for exploring the Sundarbans. Expect very little rain and temperatures between 15 and 25 degrees Celsius. The summer rains (June to August) bring greener than green scenery, but flooding can disrupt travel plans. Honey-harvest trips are April only. Advance bookings: For multi-day trips from Khulna, try to make a booking at least two or three weeks in advance, if not more. Even if you can't book online (The Guide Tours, for example, allows you to book from home through wire transfer, but doesn't have its own online booking system), you should be able to at least reserve a place on a trip, which you can then confirm once you arrive in Dhaka. Small boats: If you're planning on taking one of the multi-day trips from Khulna, consider booking yourself onto one of your tour operator's smaller boats. The larger boats carry as many as 50 passengers, so can get pretty rowdy.